I am not a comic book or superhero fan, preferring more down-to-Earth characters facing situations that are more real world than fantasy. 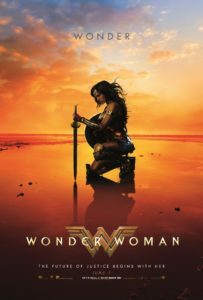 Yet, Wonder Woman is an excellent movie, one of my favorites so far in 2017 (see my movie review here). For many, the strong female character is a big benefit, and I agree. As a novelist who features strong female characters in all my books, I found Wonder Woman’s emphasis on a strong, multidimensional character gratifying and long overdue. I attribute this to the directorial prowess of Patty Jenkins as well as the charisma and strength of Israeli actress Gal Gadot in the title role. But Wonder Women distinguishes itself on several other dimensions as well. Here are five not-so-obvious elements to love about the film. Combat choreography. The hand-to-hand combat sequences show a physical and emotional level of skill that is rare among actors and an attention to detail and fluidity unusual for Western filmmakers. As someone who studies martial arts (To-Shin Do ninjutsu), I appreciated the attention given to these details because it adds an authenticity to the actions of the characters and the plot. The interpersonal combat sequences reflect real combat techniques that can plausibly create the physical effects they intend to project (although, as in all action films, they are exaggerated for the camera and enhanced with special effects). Gal Gadot’s two years of military service as a combat trainer in the Israeli army no doubt adds to this authenticity. She know how to throw a punch and kick, the camera does a great job of capturing these maneuvers, and the director has used special effects such as slow motion to emphasize them as an integrated part of the action. The special effects are scaled. I still remembered being bored as I watched one of the Superman films as New York City (or was it Tokyo…or Chicago…or….?) was being decimated for no apparent reason other than to “wow” audiences with special effects. The effects did not move the story forward in any meaningful way—they were just showing a good guy and a bad guy throwing punches to see who would persevere and be left standing at the end. Jenkins, however, has scaled the effects in Wonder Woman to reflect the place and context of the scene and character. While we see and experience wild explosions and other fantastical elements, they don’t overwhelm the story or the characters. A woman directed the big budget, superhero action film. Okay, this is obvious. But the significance of the trust the studios put in Patty Jenkins, and her ability to deliver a high quality superhero action film, should not be underestimated. This is a threshold event, probably more significant that Kathryn Bigelow’s success with war/thriller The Hurt Locker in 2008. Bigelow was the first woman to win an Academy Award for Best Director and the film won for best picture. I would not be surprised if Wonder Woman is nominated for Best Picture and Jenkins is nominated for Best Director. While the film is likely not strong enough to win Best Picture, Jenkins’ directing may well make her a favorite for Best Director. Unfortunately, Wonder Woman is marred by a few significant plot holes and inconsistencies early on the film. But those will be the subject of another blog post. In the meantime, Wonder Woman is an excellent, engaging, and sophisticated action film that deserves in commercial success as the box office and the acclaim it has received from critics. This entry was posted in Film making, Films and tagged Chris Pine, film making, film review, Gal Godot, Patty Jenkins, Wonder Woman on June 22, 2017 by SR Staley.